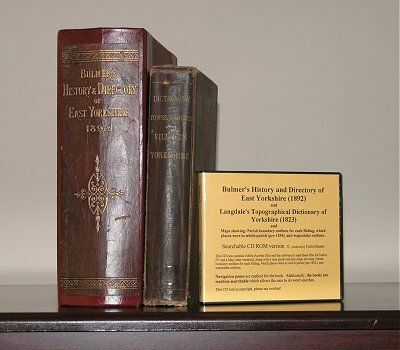 with Langdale's 1822 Topographical Dictionary of Yorkshire on CD Rom. Delivered FREE anywhere in the world direct from the supplier. The format of theBulmer's book is a fairly standard "History and Directory" format, with the Histories being more detailed than the equivalent White's/Pigot's/Baines'. The 1892 East Yorkshire book has some 1233 pages plus about 20 pages of advertisements. Most of the Directory of Trades and Professions sections (roughly equivalent of todays Yellow Pages) are divided into "Farmers" and "others". The town of Hull (now a city) however has some 500 pages devoted to it and includes both alphabetic by surname and alphabetic by trade/profession - the same names do not always occur in both for some reason. Also included is an alphabetical street directory. Note: There is a reference to 'Metcalfe Family' in the index.